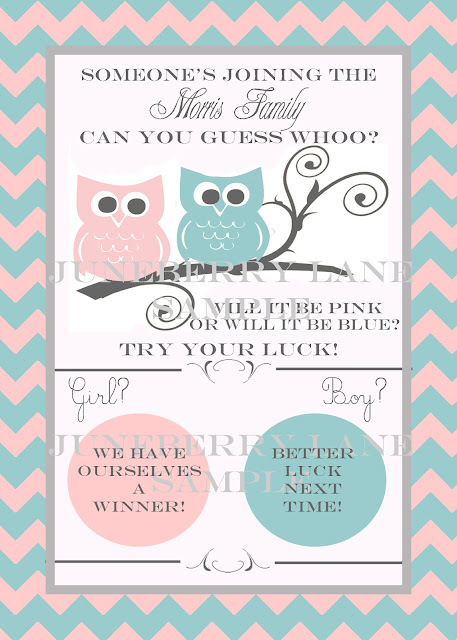 I am excited to bring you the addition of another gender reveal announcement to the shop! We've been getting quite the demand of our elephant scratch-offs and a few of my favorite customers have been asking when we will have more in the shop. Well, we've been a bit busy over here, with the new little one and all, but I managed to put this new Baby Owl one together, and I promise to have more over the next couple of months . . .
Now just in case you forget how it is done, you can DIY your own scratch-off circles (I will send you the PDF of both boy and girl-so as soon as you find out the gender of your little one, you are ready to print them!) Then you mail them out to all of your friends & family (or pass them out at your baby shower!) and let them try their luck and take a guess! Super simple and just so cute too!! Don't see the design you were hoping for in the shop? No worries, just send me a message and I would be glad to put something together for you! !